Overview: This paper examines the flow experience of elite athletes and how sports products interact with athletes in facilitating a flow experience. Sports products enhance confidence and control when the products perform to an athlete’s expectations and the athlete has developed complete trust in them. The paper begins with the characteristics of a state of consciousness known as the flow experience. It then explains how sports products interact with the athlete to build a level of trust that helps an athlete attain a flow experience and potentially a peak performance. To enhance this discussion, the paper draws on an Athlete Insight interview with Raevyn Rogers (shown above), a five-time NCAA champion and now a pro with Nike. A flow experience occurs in a high-stakes competition when the athlete loses self-consciousness, time seems to move much slower, and the athlete has elated feelings of self-accomplishment.1 This is when a peak performance is most likely to occur, as presented in Exhibit I. 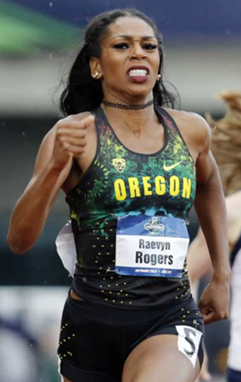 For Raevyn Rogers, her best opportunities for a flow experience have been in high-stakes challenges such as the NCAA Championships and Olympic Trials where the stage is big and the competition is greatest. High-stakes performance situations provide the extra motivation and focus for her skills to excel and to start her on a flow experience, as she describes below in a recent SPM Athlete Insight interview. “Flow, for me, starts when I’m on the line. Walking from underneath the hipping tent and onto the track… other competitors are with you. You don’t know what’s about to go on. People are talking around you, saying ‘Yeah, let’s go Raevyn’ from above. When people say my name, I don’t look at them because I’m trying to stay focused. Challenge and skills: The athlete’s above-average skills intersect with a readiness for a high-level challenge. An elite athlete in a low-level competition cannot achieve the motivation needed to attain a flow experience. 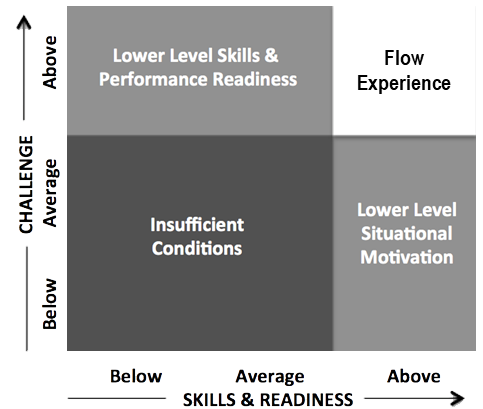 Likewise, an athlete with low-level skills or a less-than-complete readiness to compete will not have a flow experience. Elite athletes attribute their flow experiences to situations where pressure and tension are extraordinarily high. Total focus: Total focus is a critical mindset and precondition for a flow experience. Athletes cease to be aware of themselves and feel a oneness with the challenge and a unity with the environment. Movement becomes effortless, which is one of the reasons for the term flow. Goal clarity: Athletes need to have perfect clarity about what they want to accomplish. This requires a situational readiness that syncs performance benchmarks with a vision of an extraordinarily high performance level for the event about to take place. A clear vision of an athlete’s goal comes with extensive preparation and training. Performance adjustments occur without thinking as goals and performance feedback are simultaneously linked. Intense concentration: Athletes are able to block out everything around them as their concentration intensifies. To achieve a flow experience, athletes need be free of anxiety and other distractions, and they must be able to sustain their intense concentration throughout the event. Supreme confidence: When in the psychological state, athletes feel supreme confidence and are in total control of their performance. With this level of confidence, athletes can exercise control over difficult situations without stress or fear of failure. Effortlessness: In the psychological state, athletes describe everything as effortless, as Olympic gold medal swimmer Katie Ledecky states in the above quote. Everything seems easy and occurs without thinking or making any extra effort. Because peak performance is associated with effortless response, it is a unifying factor in the flow experience. In the flow experience, athletes lose self-consciousness, they become less aware of their surroundings, and time is transformed. Everything moves slower—time, people, objects, and sound. The athletes are absorbed in their task, largely unaffected by things outside themselves. In the flow, they are in a euphoric zone of self-fulfillment. Loss of self-consciousness: Athletes can be caught in moments of disruptive thoughts. They may question their ability or become concerned about the opinions of others. In the flow experience, athletes are released from disruptive thoughts because they are so thoroughly absorbed in their performance that there is no room for them. Time slows: The most common feature of a flow experience is that everything seems to move slower; time seems to be extended. But the flow experience also transforms time in another way: When the event is over, the athlete’s perception is that time during the event went incredibly fast. Autotelic experience: This part of the flow experience is a self-actualization. It is a deeply personal sense of reward and enjoyment. To have a flow experience requires the conditions presented in the first box of Exhibit II. To enter the psychological state requires athletes to have complete trust in the sports products they use in their particular sport. To earn an athlete’s trust in a sports product, the product must offer a compelling functional benefit, have a comfortable and feel-good fit, and provide proven and reliable performance, as shown in Exhibit III. These requirements for earning an athlete’s trust are described below in greater detail. Function and fit: A superior sports product has some functional benefit over competing products and provides the desired fit.5 For example, pro-tour golfers seek a functional benefit for each golf club, and they want clubs that uniquely fit them with regard to the golfer’s height, physique, and swing dynamics. Comfort, feel, and look: The sports product has to be comfortable and feel good. The feel-good part of a sports product also includes the look in terms of design and color. While a subjective assessment, these features have to connect with the athlete. For a pro-tour golfer, the club grip has to be comfortable and the club feel must be just right for the golfer’s swing. With regard to apparel and shoes, pro-tour golfers also seek products that have the comfort, feel, and look that they want. Proven performance: The sports product has to deliver the desired functional benefit and performance.6 If the product does not perform to expectations reliably, the product cannot earn the athlete’s trust. For the pro-tour golfer, consider a driver. When the driver consistently delivers the desired distance and accuracy in practice and tournaments, the golfer acquires a complete trust in that driver. The athlete’s complete trust in a sports product is one of the necessary conditions for a flow experience. Such trust “connects” the athlete with the product, creating one of the bridges leading to entry into the flow experience. The athlete’s trust is the net result of a sports product’s functional advantage and desired fit, its comfort, feel, and look, and its proven and reliable performance. Such a high level of trust is one of the factors that enables an athlete to engage the psychological state and unleash total concentration and confidence, as shown in Exhibit III. With complete trust in a sports product, an athlete with the right pre-conditions has great prospects for a flow experience and a peak performance. In designing products for competitive athletes, product teams need to engage in athlete insights. The engagement can range from watching athletes prepare and perform to in-depth interviews about their needs, experiences, and aspirational goals. It can also include questions about their biggest frustrations with the sports products they use and the product benefits they want but cannot find in the sports products currently available. To illustrate the role of sports products in the flow experience, the authors conducted an athlete insight interview with Raevyn Rogers. Presented in Exhibit IV are her athlete insights with regard to sports products and the flow experience. Football gloves: Football gloves provide another example of how a sports product impacts athlete function, comfort, and performance. With regard to function and fit, football gloves are made for different athlete functions and in different sizes. Quarterbacks wear regular gloves, receivers and running backs use gloves with palms that are a bit stickier, and linemen wear gloves that have thicker padding and no fingertips. Football gloves also offer comfort and protection. Gloves keep a player’s hands dry and warm, and they help protect against abrasions and cuts. Comfort is especially important in extreme cold, rain, or snow. Finally, product performance is delivered in the form of a firmer grip that helps receivers make more catches, helps runners avoid fumbles, and helps quarterbacks hold on to the ball before releasing it on passing plays. Experiences in practice and games create trust. With trust comes confidence. And, with supreme confidence comes the potential for a flow experience. Women's swimwear: Probably more so than for any other sports product, the product requirements for women’s swimsuits are critical when it comes to fit and function, comfort, and performance. For these athletes, their swimsuits are their “second skins,” and every aspect of the product can play a role the athletes’ trust and confidence levels, as shown in Exhibit V.
It takes 20 minutes to painstakingly put on the delicate, lightweight, compression-fabric swimsuits that women competitors wear. Because the swimmer wants a suit that perfectly fits her unique body size and shape, function and fit can be a challenge. Straps, cut, and seams are all potential points of discomfort. Once any problems are resolved, the swimmer can feel and look good in her comfortable and perfectly fitting suit. The swimsuit still has to perform. For competitive swimmers, a suit performs well if it does not ride up during competition, the fabric does not pile and create drag, and the suit repels water to maintain its lightweight. Once a suit has earned a swimmer’s trust, she can more easily move into the psychological state of supreme confidence and then achieve a flow experience. Pole vault: Finally, perhaps the most dramatic impact that sports product innovation has had is on pole vaulting. The height for the current pole vault world record is more than double the records set around 1850, as shown in Exhibit VI. The world record was last broken in 2014, surpassing Sergey Bubka’s record set 21 years earlier. As important have been product innovations in shoes, apparel, and track surfacing materials. The evolution of all pole vault sports products is shown in Exhibit VII. With each innovation has come an increase in elite vaulters’ confidence, control, and trust, all facilitating factors in the flow experience. The end result has been a continuous run of new world records, with dramatic spurts in the bamboo and fiberglass eras. Summary: Sports products by themselves cannot generate a flow experience and a peak performance, but they can either diminish or enhance the experience and the performance depending on the athlete’s level of trust in the products. To earn an athlete’s trust, a sports product needs to meet the athlete’s needs for function and fit, comfort, and performance. When a sports product delivers on these needs, the athlete acquires trust in the product, which enhances confidence, control, and the potential for a flow experience and a peak performance. Csikszentmihalyi, Mihaly. Flow: The Psychology of Optimal Experience. New York: Harper Perennial, 1990. Vaughn, Damian. “Citius, Altius, Fortius: Finding Optimal Motivation for Flow in Sport.” Master’s thesis, Claremont Graduate University, 2016. “Katie Ledecky Quotes.” BrainyQuote. Accessed November 9, 2017. https://www.brainyquote.com/quotes/quotes/k/katieledec770991.html. Brock, Marcie. “The Writing ‘Zone’: Pinnacle of Fun!” Marcie Brock, Book Marketing Maven. September 29, 2015. https://marciebrockbookmarketingmaven.wordpress.com/2015/09/29/the-writing-zone-pinnacle-of-fun/. Kamalha, Edwin, Yongchun Zeng, Josphat Mwasiagi, and Salome Kyatuheire. “The Comfort Dimension: a Review of Perception in Clothing.” Journal of Sensory Studies 28, no. 6 (December 2013): 423-444. http://dx.doi.org/10.1111/joss.12070. Dlugosch, Sabine, Hong Hu, and Allan CK Chan. “Impact Protective Clothing in Sport: Areas of Application and Level of Utilization.” Research Journal of Textile and Apparel 16, no. 3 (2012): 18-28. https://doi.org/10.1108/RJTA-16-03-2012-B002. Watkins, Calvin. “Miles Austin Goes without Gloves.” ESPN. 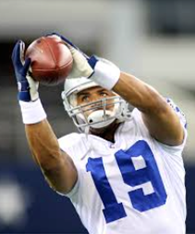 November 3, 2010. http://www.espn.com/blog/dallas/cowboys/post/_/id/4674023/miles-austin-goes-without-gloves. Best, Roger, and Chris Sataua, “Pole Vault World Records and Sports Product Innovation.” Lundquist College of Business. July 24, 2016. https://business.uoregon.edu/news/pole-vault-world-records. Damian Vaughn is an assistant clinical professor of product management with the University of Oregon, teaching courses in strategy and leadership. He is a former NFL tight end with the Cincinnati Bengals and Tampa Bay Buccaneers. Damian holds a PhD in psychology from Claremont Graduate University where he was under the tutelage of Dr. Mihaly Csikszentmihalyi, the author of Flow: The Psychology of Optimal Experience. He has held executive positions in the media, entertainment, and technology industries. Roger Best is an emeritus professor of marketing at the University of Oregon and author of Market-Based Management. He is a cofounder of the UO Sports Product Management program and director of SPM research. Roger has a BS in electrical engineering and an MBA and PhD in marketing. He started his career at General Electric in engineering and product management and then went on to be a Fortune 100 marketing consultant and UO marketing professor. Robin Vieira is a master's program student in the UO Sports Product Management program. She received her degree in exercise science and neuroscience from the University of Puget Sound where she played four years of soccer. Robin just completed her internship in product line management at Patagonia and is currently interning at Pendleton Woolen Mills in womenswear merchandising. The University of Oregon Sports Product Management program’s mission is to be the worldwide leader in sports product management education and research. Online sports product research papers are a part of the research portion of the SPM mission. To mark Women's History Month, the University of Oregon highlighted women faculty members who are making a difference, including Lundquist College's Aparna Sundar. In a piece for The Conversation, marketing professor Joshua Beck looked into the ideology behind veganism and why the lifestyle can be such a hot-button issue for others.